Even with the rise of digital payments, cash is still a popular form of payment. According to the Federal Reserve, consumers use cash to pay for nearly one-third of all retail transactions. For many retailers, a completely "cashless society" is nowhere in sight. Cash management remains one of the most important aspects of managing a retail operation, particularly at quick service restaurants (QSRs) and convenience stores, where transactions are smaller and cash is a preferred method of payment. 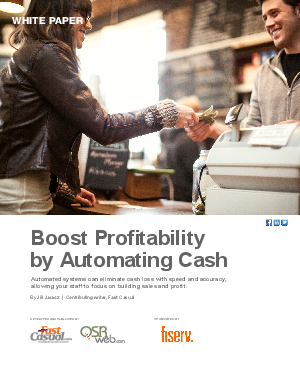 This white paper, Boost Profitability by Automating Cash, sponsored by Fiserv and Fast Casual, details the steps to manage cash properly and boost profit for your business. Uncover the top reasons and flexible options to automate your cash management.